I decided to move my Corporate Blogs from Novell Cool Blogs to Novell Cool Solutions. I announced this in October; this month I started the move. Mainly the volume of postings and the amount of traffic at Cool Blogs compared with Cool Solutions. Cool Blogs started as the first open, unfiltered blog from Novell almost two years ago. Since then I’ve made over 25% of the posts to the blog. That’s too much. I’ve slowed my blogging on Cool Blogs and moved a lot to this site; but still the proportion of posts that are my ZENworks posts is too high. By posting on Cool Solutions I hope that my posts get a wider readership and I don’t take a too large proportion of the postings. A long title for a short post. Here’s how to build a custom agent deployment package with either no server details (add them via registration at deployment time) or with a single DNS name. More how-to guides. This one is turning on ZCM agent-side debugging. The Novell ZENworks Agent Service service is stopping. The Novell ZENworks Agent Service service was stopped successfully. The Novell ZENworks Agent Service service is starting.. The Novell ZENworks Agent Service service was started successfully. The log rolls – so you might need to collect the zip as well. Yesterday I was creating a Dilbert comic that will run in August. 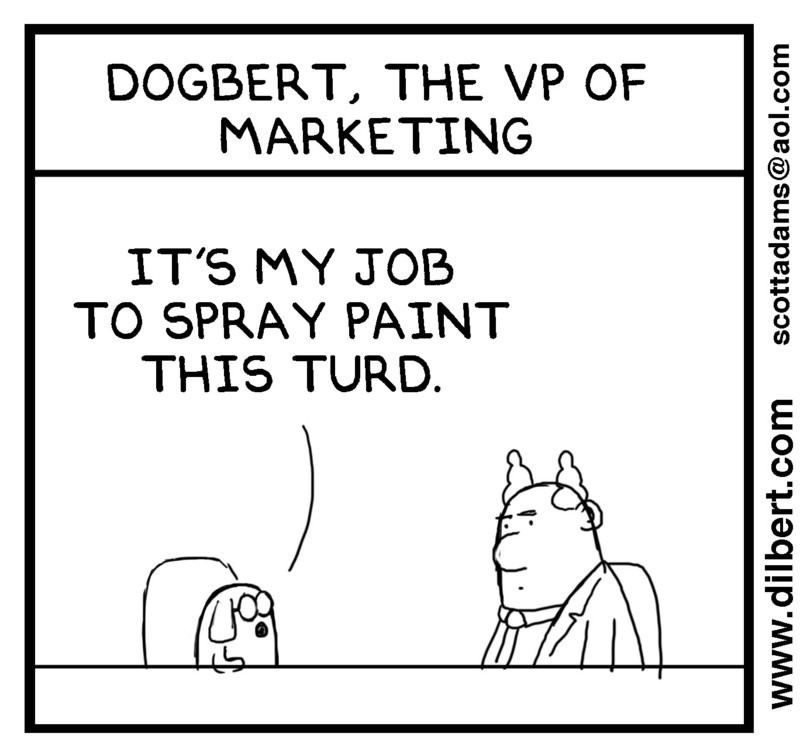 In the first panel, Dogbert needed to describe his job as VP of marketing. How do you do that in the fewest words? Here was my solution. Feel free to leave your own comments.. I spent some time this morning on the forums for the ZCM open beta. A frequent comment is regarding downloading the ZCM ISO – it’s 4GB in size. I recommend testing the md5 hash – I use Digest IT 2004. Want to be a ZENworks Product Manager? There are a few open opportunities within the ZENworks Business Unit for Product Managers. Ideally we are looking for people who can ‘hit the ground running’. If you need any additional information – or if you want to apply – get in touch via the Novell email address. Someone will get upset at this… Ah well. Here’s my collection of stuff for an email I’m writing later. Just examples of ‘crap and bloated’. .. here’s how the design process worked: approximately every 4 weeks, at our weekly meeting, our PM would say, “the shell team disagrees with how this looks/feels/works” and/or “the kernel team has decided to include/not include some functionality which lets us/prevents us from doing this particular thing”. And then in our weekly meeting we’d spent approximately 90 minutes discussing how our feature — er, menu — should look based on this “new” information. Then at our next weekly meeting we’d spend another 90 minutes arguing about the design, then at the next weekly meeting we’d do the same, and at the next weekly meeting we’d agree on something… just in time to get some other missing piece of information from the shell or kernel team, and start the whole process again. I’d also like to sketch out how actual coding works on the Windows team. In small programming projects, there’s a central repository of code. Builds are produced, generally daily, from this central repository. Programmers add their changes to this central repository as they go, so the daily build is a pretty good snapshot of the current state of the product. The end result of all this is what finally shipped: the lowest common denominator, the simplest and least controversial option. Design by committee is a wry, pejorative term referring to a style of design and its resultant output when a group of entities comes together to produce something (often the design of technological systems or standards), particularly in the presence of poor and incompetent leadership. The defining characteristics of “design by committee” are needless complexity, internal inconsistency, logical flaws, banality, and the lack of a unifying vision. Design and style much more relate to intuition and aesthetics than science or politics. ZENworks Configuration Management is currently in beta – one of the new pieces of the product is the ability to control and configure the client and the server environment wholly from the command line. By default the command line tool – zman – picks up the server locale. In some cases it is useful to be able to force zman to use a specific language. Here’s how in beta 3. This may change for the released product. Note – all on a single line; differences highlighted. l made sure I flagged this as satire. This is from November 2000 when Novell was in the middle of the One Net rebranding.